The desire for closer access inspired the Side Loading Hybrid Platform Lift. 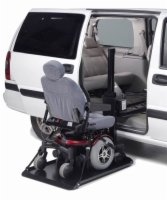 This lift will deliver a power chair or scooter right next to the driver or passenger's door. Simple, one button operation and drive-on, drive-off simplicity make the Side Loading Hybrid Platform Lift one of the most user friendly lifts available.